California Abyssinian Rescue View other Abyssinians for adoption. Monet, her siblings and mother Cassatt were saved from euthanasia at an area shelter. Monet's mother is an Abyssinian Mix. 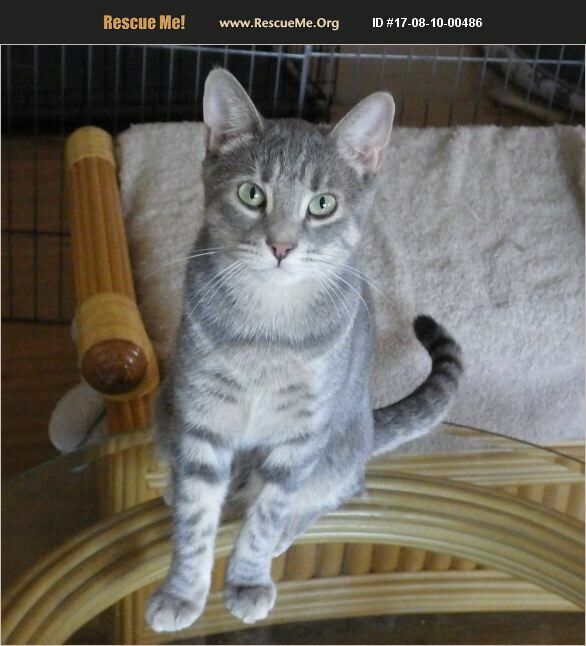 Monet is an adorable petite gray tabby whose estimated date of birth is 3/12/16. She weighs about 9 pounds. Monet is the sweetest cat ever! She is loving and playful and is looking for a good permanent indoor home (for her expected lifespan of 15+ years). She is looking for a quiet home with one or two people who will be understanding and patient with her to allow her time to adjust and be comfortable in her new home. She has been spayed, vaccinated, dewormed and is negative for feline leukemia virus. The cats blossom in their own homes and become great companion cats. However, living in a rescue environment with many cats is not the same as living in its own home, so the longer he/she is at the rescue, the harder it is to show the cat because most cats become afraid of strangers. A cat needs the one-on-one attention of being in its own home and does really well if given a chance. Please consider these cats and give them a loving home so they do not have to spend the rest of their lives in a rescue. They deserve their own homes. Most cats/kittens are scared going to a new home with new people, but they all blossom in their own home. We never know how long it will take for them to become comfortable in their new home because all cats are different, some cats walk in and make themselves right at home, sometimes 2-3 days and sometimes weeks. $50 adoption fee, cash only, which is to help reimburse for a portion of expenses of cat rescue and rehabilitation. Adoption contract required. Location: Quail Valley/Menifee, Southwest Riverside County. Local adoptions only; within 50 miles because we deliver animal to its new home. (Please note: L.A. and Orange Counties are out of area.) We are looking for adopters who are willing and able to care for this pet for its lifetime (15+ years). If interested, please email us with a little info about you, your family, your other pets, where you live, etc. and what type of cat you are looking for--indoor, outdoor, or? Thank you. Our adoption process involves meeting the animal, either at Petco in Menifee on Saturdays from 10-2 or by appointment on other days at the rescue in Quail Valley. We have the best interest of the animal in mind and our goal is to find a good, permanent home for each of our rescued animals. We have the right to decline an application if we feel it is not a good match or fit for the animal. If you like the animal and we both feel it is a good match, an application and adoption contract is completed. A convenient day/time is arranged for us to deliver the animal to its new home to do a home check (to make sure the home is safe and secure). We will collect the adoption fee (cash only) when we deliver the animal to its new home. All our adoptions are on a trial basis because our goal is to have a successful adoption where the animal has a good permanent home and never ends up in a bad situation again. We ask that you give the animal a chance to adjust and settle in his new home and environment. Going to a new home with new people and a new environment is traumatic and stressful. It will take time for the animal to become comfortable around you and his/her new home. This should be a bonding period where you get to know the animal and connect with it, spend time with it and take things slow. He/she will need to get to know and trust you and learn the rules of the house and what is expected of him/her. This takes time, sometimes 2-3 weeks. During this time we will hold the adoption fee and if the adoption is not working out, we ask that you contact us and return the animal and we will refund your adoption fee.